Just as the global health food trend indicates, organic food production is gaining momentum in ASEAN countries. It appears that three factors have given impulse to this upswing: the abandon of traditional farming in favour to industrial farming, deteriorating public health, and new lifestyles including food awareness. Organic scenes are interspersed, progressive and yet limited in their outreach. They involve civil society stakeholders and are institutionalised in a range of consumer groups, farmers associations, farmers markets, health shops, delivery schemes and urban gardening groups (cf. Asian Farmers' Association), one objective being “to strengthen and move forward the existing movement of agroecology in Asia” by achieving environmental and societal well-being (Towards Organic Asia). The organic farming business generally accompanies those scenes. Several countries have introduced organic labels (cf. e.g. VECO Vietnam; GOVPH). The governments of individual countries have started to engage in organic farming policies, although with some reluctances. Budget is being allocated for organic farming training, workshops and marketing. However, the success of those measures has to be seen with reservation for many hardly sustained (cf. Htoo Thant (b), Bopp 2016: 181). The Association of Southeast Asian Nations was created in 1967 with the idea of physical and symbolic regional unity that would embrace the members' distinct features and ambitions. It eventually widened its commitment to promulgate the ASEAN community in 2015. At the occasion of this years' 50th anniversary, their principles and purposes are newly announced. They stress: social responsibility and solidarity among the members in achievement of a “common identity”, “a caring and sharing society” “where the well-being, livelihood, and welfare of the peoples are enhanced” (ASEAN 2017: About Asean). Assuming that the improvement of livelihood and societal well-being is directly linked to food and agriculture, it could be argued, the enabling of sustainable and organic farming should be among ASEAN’s ambitions. Undernutrition is reported for several ASEAN countries, and most regions deal with malnutrition (cf. ASEAN Sustainable Agrifood System: 1, 8). Action therefore needs to be directed at the assurance of food in terms of both quantity and quality. The integrated food security framework and action plan as a reaction to the economic crisis of 2007/2008, released in 2009, takes into account the livelihood of farmers, sustainable food production and nutrition-enhancing agriculture. In this context, allusion is made to organic farming as one element within climate smart agriculture and overall food security, albeit not further specified (cf. ibid.). “Thailand received the World Bank's assistance during the 1960s to strengthen […] conventional mono-crop agriculture. Yields increased at first thanks to the application of chemical fertilizers and pesticides on the fields. […] Indeed, from about the 1970s on, farmers started to shift to new plant varieties, animals and the use of fertilizers and to target on sale in accordance to new agricultural development models, as well as taking first loans for their investment. A just established train line connecting Bangkok with Chiang Mai facilitated the spread of agrochemicals to the North [...]. Today's conventional agriculture is not efficient anymore and will soon collapse if the current system continues to exist” (Bopp 2016: 169). In fact, this reflects a usual reality in other ASEAN countries (cf. Tadeo and Baladad: 4ff. ; Edwards 2013: 74; VECO Vietnam), and yet no consistent common strategies of sustainable food movement has been forged. While the shift to alternative strategies urges, many farmers are not easily convinced, as they adjust their farming according to market opportunities and find organic farming challenging. Regardless, some farmers realise the long term benefits of shifting to the organic alternative (cf. Bopp 2016: 266). Despite the countries' ability to produce food locally, the share of imported foods is notable. With the ASEAN Economic Community (AEC) comes the opening of the Southeast Asian market encouraging further import, often cheaper, that can impact local farmers' ability to compete on the markets (from expert interview R-4, Bopp 2016). In this sense, organic farming might be an opportunity for farmers for its prospect of consistent prices at local markets and farmers' self-reliance. The public availability of food is of relevance in the Asian countries for it is common in many places to take one's meals from restaurants or street vendors. Consumers hence depend on the public procurement of foods which particularly concerns the urban consumers who tend to cook less at home. In the rural spheres, farmers often maintain chemical free kitchen gardens for their own use, given that they dispose over their farm land; and yet, a widespread reality is, few farmers are able to spare time or space to grow for their home use (cf. Bopp 2016: 125; Tadeo and Baladad: 9). The heavy use of agrochemicals in food production severely spoils farmer and consumer health (cf. e.g. Bopp 2016: 185; VECO Vietnam; Somasundram et al. 2016: 1). Organic farming movements all over ASEAN are a response to that, and yet is their importance still slight (cf. Tadeo and Baladad: 9). Availability of organic food products typically varies from farmers markets, delivery schemes to supermarket sections. Certification is generally required for supermarkets, however, many consumers and producers prefer the so-called trust-based guarantee. Unless organic products receive certification, they are basically marketed on local or regional platforms. Except for Singapore which is not self-sufficient in terms of foods, pan-ASEAN trade with organic products seems still uncommon. A common organic standard for Asian countries already exists. It facilitates equivalence among diverse regional standards, market exchange and global recognition (cf. UNCTAD 2012: 1). Its ASEAN equivalent, the ASOA, has recently been envisaged, including a labelling system (Vientiane Times / ANN 24/05/2016). It is supposed to specify methods as typically required in organic production, such as soil fertility, water and crop systems (cf. Association of Southeast Asian Nations: 5 ff). An opposing point of view to that is, systematic ASEAN organic certification tends to upscale the product prices and thus exclude potential consumer groups (from interview R-37, Bopp 2016). There is agreement on the notion that organic farming shares most of its features with the traditional farming as it used to be practised widely on small-scale farms. There is diversity within ASEAN concerning climate and soils, plant varieties, and cultivation methods but regardless, traditional farming has manifested as an integral characteristic of Southeast Asian agriculture (UNCTAD 2012: 2). While the modern understanding of organic farming draws from newly standardised notions in Western countries, traditional cultivation in Southeast Asia is almost inherently low-impact and biodiverse (cf. Bopp 2016: 73; UNCTAD 2012: 2, 3). In contrast, countries almost commonly began to adopt modern technologies and synthetic input as part of their food security agendas which initially favoured their entrance into the competitive regional and global markets. Over the period of Green Revolution and the continuous advance of agro-chemicals, traditional farming knowledge as a resource progressively faded all over Southeast Asia. Government subsidies of agrochemicals are common reality (cf. Bopp 2016: 97). Many alternative food movements in Southeast Asia began by the needs of rural farmers. Decreasing rice prices, extreme climate related events such as typhoons, floods or droughts shifted rural households into widespread poverty; and organic farming was introduced as one mean to relief. It can provide an alternative livelihood strategy for farmers in rural or urban areas, and can beyond provide mitigation for climate change related impact (Tadeo and Baladad: 7). 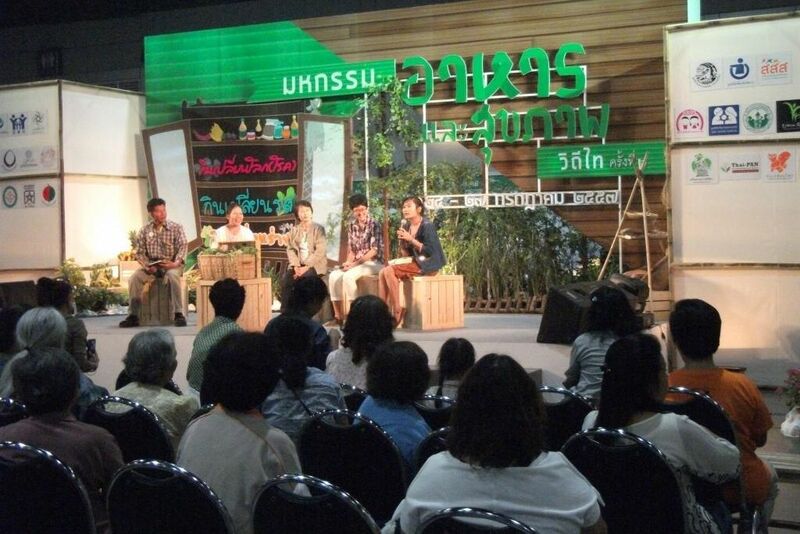 Thailand nowadays has many organic producers measured against its size but they are weakly organised among each other. Contract farming is posing unfair trade conditions between farmers and companies, a reason why some farmers consider the change to organic farming (Bopp 2016: 172). Despite recent momentum, organic farming is re-interpretation of traditional practice as typical for small-holders in the entire region. Those self-reliant practices were newly emphasised since the 1980s by NGOs and activists endeavouring the progress of impaired rural livelihoods. Traditional Thai agriculture is small-scale after widely organic principles, drawing upon farm internal inputs such as manure, compost, heirloom seeds, and water storage. The currently growing organic scenes — which is urban to a great extent — is hence more akin to reemergence than new trends, and mirror their roots in the lives of rural farmers. Within the organic movement, stakeholders are clearly determined by their health concerns— many experience cases of illness personally or within their family. Beyond, a “great part of demand for organic food originates in Bangkok where urbanites are missing options to grow or to have control over their own food” (Bopp 2016: 91, 92). The organic movement hence began to gather urbanites who try to follow alternative lifestyles as much as the megacity allows them, realising simple and eco-friendly living, urban organic gardening and social community. Consumer motivation is mostly personal but can transmit solidarity with producers, too. Thus are consumer and producer concerns interconnected, and mutual benefit can happen when the organic farming movement is strengthened. Unless compliance to the safe use of synthetic fertilizers in agricultural production is given, demand for organically produced foods will grow for expected health benefits, as for now notably driven by wealthy middle classes, expatriates and foreign tourists (cf. Nyun 2016). Similarly to other ASEAN regions, Myanmar farmers deal with little financial stability, confiscation of their home and farm land, labour shortage due to out migration. Their situation forces many to invest in cash crops rather than growing for their own household, although Myanmar agriculture is still largely small-scale. Due to previous political reservedness, the organic farming business took much time to develop, but a private sector association (MOAG) was set up in 2009 for organic farming support and certification. Thus, six organic farms had received their label by 2011 (cf. Greennet: Myanmar Organic Agriculture). Promotion of organic farming is a key objective in Myanmar's latest climate-smart agriculture strategy of 2015 but has not yet been endeavoured officially (cf. Hom NH et.al. : 6). Priority seems to be given instead on GAP practices, since there is ambition to embark on the ASEAN market. In contrast, organic principles will take much longer to become settled (cf. Htoo Thant (a)), although it was declared, “the GAP system was introduced as an intermediate measure“ towards the entirely pesticide free organic production (Htoo Thant (c)). As much as governmental promotion of organic farming is largely lacking in Myanmar, it is NGOs that drive the sustainable scenes for rural development: Metta NGO aims at local communities throughout the country to support self-reliant, eco-friendly local farmers' practices for healthy lifestyles. “[E]ndemic poverty, armed conflict and humanitarian emergencies“ shall overcome (Metta Development Foundation 2014: 4). So-called Farmer Field Schools address food security and natural resource management embracing organic farming methods, quality seed saving and soil conservation, and are meant to support eco-friendly local farmers' practices to replenish soil and promote their healthy lifestyles. However, a number of above mentioned challenges persist. (cf. Metta Development Foundation 2014: 8, 11). With a high population density and built-up surface, the city state cannot provide vast arable area. By urban extension, farming areas ever diminished. Although some of the local supply – particularly leafy vegetables – is produced in Singapore itself, consumers depend to 90 percent on imported products (cf. Ling Ling 2015). Recent acquisitions were about 200 indoor agrotechnology parks in replacement of farm land, using intensive cultivation on soil, or hydroponics. Nonetheless, emphasis on preserving areas for food farming remains: The Agri-Food & Veterinary Authority AVA – a Ministry of Agriculture does not exist in Singapore – has just launched tenders for farm land lease: “Local production, in particular of key food items such as vegetables, fish and eggs, remains an important part of Singapore’s food security” but shall “adopt modern practices to be more productive given these land constraints” (Agri-Food & Veterinary Authority Singapore 2017(a) / (b)). Inside the city, urban gardening initiatives are presently being established to alter with the cityscape. They demonstrate creative alternatives to the agro-parks that also private persons can simply realise. They run on civil initiate but AVA is also involved by training and demonstration (cf. Ling Ling 2015). Several organic shops and ordering schemes currently cater the Singaporean scenes of health conscious people. Those mostly source either from international suppliers or from their own farms that run in the neighbouring countries (The Best Singapore (b)). Products originate in Malaysia, Australia or Thailand – an organic producer in Southern Thailand gets regular orders from Singapore for her chicken eggs; a Northern Thai project for fruit and vegetables (cf. Bopp 2016: 130; 126/127). Local organic production has not yet reached sizeable impact; however, several smaller farms in the city's surroundings grow organically, deliver to urban households and invite for educational tours. An established eco-farm supplementing their production by imported goods does without certification as they “have no plans to sell [their] vegetables outside of Singapore” (GreenCircle Eco-Farm 2016). Their concept – “local veggies in local farm to supply for local consumers” has “won the hearts of Singaporeans” (The Best Singapore (a)). The cases demonstrate that the shift to organic farming methods is urgent for many small-scale farmers all over ASEAN, and supported by the growing demand of health conscious consumers. The scenes derive from very similar realities and urges. Access to safe and nutritious foods should be an asset for citizens, therefore, organic food provision should include non-wealthy consumers. This is one reason for self-certified or trust-based organic trade to be popular among ASEAN: as the certification process is rather costly for producers, it is little suitable for the local markets for adding costs to the final product. Most small-scale organic projects hence go for direct sale schemes which allow fair prices for both consumer and producer. Organic farming as done either way, trust-based or certified, seems to provide a new livelihood strategy for farmer households all over ASEAN. As health food demand is likely to grow further, and environmental as well as socio-economic challenges are unlikely to moderate in the near future, farmers may expect stable markets from it, especially when they interact with the committed consumer groups. Health benefits experienced from dropping of chemical inputs will be drawn on the long run, and financial impasse can be resolved. When organic farming is attributed a key role in ASEAN’s agriculture, the movement can empower farmers and consumers and align with the international scenes. When done in co-existence with small-holder farming, the common ASEAN organic strategy might bring about opportunity for export. However, the intentions of local farmer and consumer groups should not be exposed through global market ambitions. Considering the risk of becoming dependent of bigger international organisations, it is necessary to protect their identity and self-reliance. Agri-Food & Veterinary Authority Singapore (a) (2017): AVA to launch tenders for new agricultural land for food farming. Edited by Agri-Food & Veterinary Authority Singapore. Available online at http://www.ava.gov.sg/docs/default-source/default-document-library/pr---...(11-may).pdf, checked on 27/05/2017. Agri-Food & Veterinary Authority Singapore (b) (2017): Farming in Singapore. Available online at http://www.ava.gov.sg/explore-by-sections/farms/land-farms/farming-in-si..., updated on 10/3/2017, checked on 27/05/2017. ASEAN 2017 (2017): About Asean. ASEAN 2017. Available online at http://www.asean2017.ph/about-asean/, updated on 2017, checked on 13/05/2017. ASEAN Sustainable Agrifood System (SAS): ASEAN integrated food security (AIFS) framework. 2015-2020. ASEAN Sustainable Agrifood System (SAS). Available online at https://www.asean-agrifood.org/?wpfb_dl=58, checked on 13/05/2017. ASEAN Sustainable Agrifood System (SAS) (2016): About us. ASEAN Sustainable Agrifood System (SAS). Available online at https://www.asean-agrifood.org/about-us/, updated on 2016, checked on 13/05/2017. Asian Farmers' Association for Sustainable Rural Development: About Us. Available online at http://asianfarmers.org/?page_id=53, checked on 28/05/2017. Association of Southeast Asian Nations: About ASEAN . Association of Southeast Asian Nations. Available online at http://asean.org/asean/about-asean/, checked on 13/05/2017. Bopp, Judith (2016): New momentum to Bangkok's organic food movement: interspersed scenes led by mindful pioneers. Doctoral. University of Cologne, Cologne. Institute of Geography. Available online at http://kups.ub.uni-koeln.de/id/eprint/6935. Edible Garden City: Photos. Edited by Edible Garden City. Available online at http://www.ediblegardencity.com/photos/, checked on 31/05/2017. Edwards, Nicola (2013): Values and the Institutionalization of Indonesia's organic agriculture movement. In Michele Ford (Ed. ): Social activism in Southeast Asia. New York: Routledge (Routledge contemporary Southeast Asia series, 51), pp. 72–88. Available online at https://books.google.co.in/books?id=xzN3LBq8-k0C&pg=PA76&lpg=PA76&dq=go+..., checked on 05/05/2017. GOVPH: National Organic Agriculture Program. Edited by GOVPH. Republic of the Philippines. Available online at http://organic.da.gov.ph/index.php, checked on 25/04/2017. 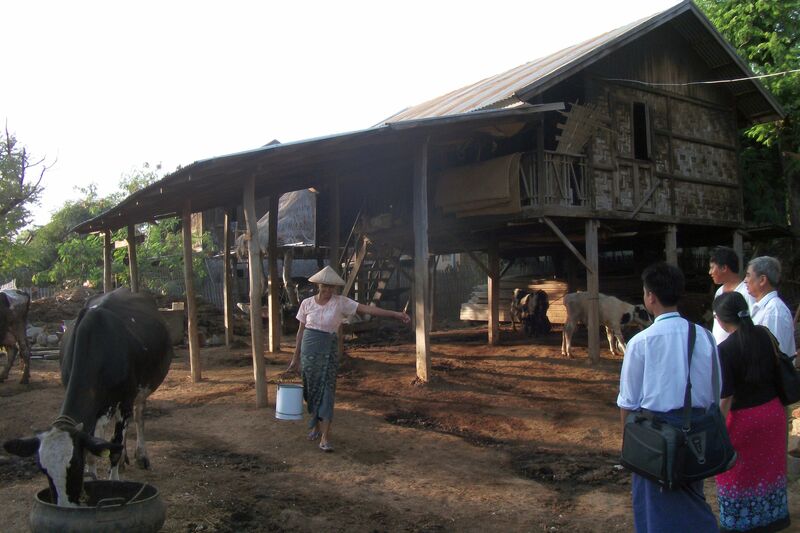 Green Net (a): Myanmar Organic Agriculture. Edited by Green Net Cooperative, Earth Net Foundation. Bangkok. Available online at http://www.greennet.or.th/en/article/1168, checked on 17/05/2017. GreenCircle Eco-Farm (2016): About. Available online at http://www.greencircle.com.sg/about/, updated on 2016, checked on 28/05/2017. Hom NH; Htwe, N. M.; Hein Y; Than SM; Kywe M; Htut, T. (2015): Myanmar. Climate-Smart Agriculture Strategy. With assistance of MOAI, CGIAR, CCAFS, IRRI. Edited by Minister's Office. Available online at https://ccafs.cgiar.org/publications/myanmar-climate-smart-agriculture-s..., checked on 17/04/2017. Htoo Thant (a) (2016): Ministry pushes to reduce chemical use in crops. In Myanmar Times, 14/10/2016. Available online at http://www.mmtimes.com/index.php/national-news/nay-pyi-taw/23084-ministr..., checked on 17/04/2017. Htoo Thant (b) (2016): Agriculture department to offer GAP training to farmers. In Myanmar Times, 20/12/2016. Available online at http://www.mmtimes.com/index.php/business/24294-agriculture-department-t..., checked on 17/04/2017. Htoo Thant (c) (2017): Mango farming gets GAP stamp. In Myanmar Times, 26/01/2017. Available online at www.mmtimes.com/index.php/business/24708-mango-farming-gets-gap-stamp.html, checked on 17/04/2017. Ling Ling, Tan (Ed.) (2015): Urban Agriculture in Singapore. Regional Consultation on “Strengthening Food and Nutrition Security of the Urban People through Urban and Peri-urban Agriculture”. Bangkok, 14-15/07. Agri-Food & Veterinary Authority Singapore. Metta Development Foundation (2014): Regeneration Initiative. 01 April 2013 - 31 March 2014. Annual Report 2013-2014. Metta Development Foundation. Available online at http://www.metta-myanmar.org/publications/Annual%20Report%202013-2014.pdf, checked on 17/04/2017. Nyun, Ruth (2016): Organic Farming vs. Commercial Farming in Myanmar. In Myanmar Business Today 4, 28/06/2016. Available online at http://www.mmbiztoday.com/articles/organic-farming-vs-commercial-farming..., checked on 26/04/2017. Somasundram, Chandran; Razali, Zuliana; Santhirasegaram, Vicknesha (2016): A Review on Organic Food Production in Malaysia. In Horticulturae 2 (3), p. 12. DOI: 10.3390/horticulturae2030012. Tadeo, S. Jaime L.; Baladad, Raphael M.: Organic farming at the center stage. A Primer on Sustainable Rice Based Farming Systems in the Philippines. Available online at https://viacampesina.org/downloads/pdf/en/LVC-PARAGOS-Organic-Book.pdf, checked on 30/04/2017. The Best Singapore (a) (2016): Green circle eco farm. Available online at http://www.thebestsingapore.com/best-place/green-circle-eco-farm/, checked on 28/05/2017. The Best Singapore (b) (2016): Zenxin agriorganic food. Available online at http://www.thebestsingapore.com/best-place/zenxin-agriorganic-food/, checked on 28/05/2017. Towards Organic Asia: About us. Edited by Towards Organic Asia. Available online at https://towardsorganicasiath.wordpress.com/2016/01/13/about-us/, checked on 25/04/2017. UNCTAD; FAO; IFOAM (2012): GOMA - Global Organic Market Access. Asia Regional Organic Standard (AROS). Edited by UNCTAD, FAO, IFOAM. Available online at http://www.fao.org/docrep/015/an765e/an765e00.pdf, checked on 30/04/2017. VECO Vietnam: Discover our projects. Safe and organic vegetables in Vietnam. Edited by Vredeseilanden. Vredeseilanden. Available online at https://vietnam.veco-ngo.org/en, checked on 24/04/2017. Vientiane Times / ANN (2016): ASEAN members seek to improve agricultural standards. In The Jakarta Post, 5/24/2016. Available online at http://www.thejakartapost.com/seasia/2016/05/24/asean-members-seek-to-im..., checked on 21/05/2017. Southeast Asia is a patchwork of networks, life-worlds, trading systems and cross-cultural pathways of human interaction. These interactions have always existed in different shapes, as a look to the rural borderlands shows. Competing trade agreements and planned infrastructure investments are dilemmas that ASEAN can only successfully solve if they approach the challenges as group that lets go if its consensus decision-making and allows for countries´ flexible participation. So far, the engagement of the ASEAN Civil Society Conference/ASEAN People´s Forum has been disappointing. A new strategy for people-to-people regional integration is needed.